If you are looking for the best rat trap, but you don’t have a lot of time on your hands, you’ve come to the right place. In this short paragraph, you will learn what model has managed to convince the vast majority of buyers that it is an excellent device for catching rats. The Havahart 0745 One-Door is made from galvanized steel and has wire mesh on the sides to allow ventilation even after the rats are trapped inside. You will not have to do anything to get it fully operational since it comes already assembled. Another thing you will like about this model is that it can be reused since the trapped animals can not damage the trigger mechanism. In case you can’t find this particular model anymore, you can go for the Rugged Ranch 100063928 Squirrelinator, as it is almost just as good. The simple design of this cage for trapping small animals makes it a winner with buyers everywhere. If you are looking for a humane solution to a pest problem, this cage can be the answer as it will let you catch the animals making a mess in your yard and then release them far away from your property. The internal edges are smoothed out to avoid injuries to the trapped animal. The structure of this cage is a bit light, so you might want to check it regularly before the critters manage to come out. A humane trap for small animals that can be used for catch and release. For someone who is dealing with a severe infestation, this trap can be the answer since it is advertised that it can catch up to 25 squirrels in a few hours. It can also be used for rats and other animals. Instead of investing in costly baits, you can opt for this particular model and catch the pesky critters by high numbers. The cage is sturdily built, and you will like its flawless operation. Be aware that while very effective, this trap is quite expensive and you might not want to shell out the money for it. A great solution for anyone who needs to get rid of a numerous population of rats. This rat trap is using advanced technologies, which might make it a great choice for anyone who is too busy to monitor rat traps at home or around it. With the help of a dedicated app, the trap will let you know when it caught something. Also, because it uses high-voltage, the rats get killed instantly, and you don’t have to worry about finding rats that are still alive when you check the trap. Cleaning the trap after each time a rat ends up inside can be a huge hassle, according to some of the people who bought it. A quick and efficient option for those who want to ensure the humane killing of rats. We took a close look at all the rat trap reviews to see which models are the most popular right now and if they have the features we consider the most essential in such a device. Here is a list of all the products that are worth your money at the moment. If you want the most effective rat trap that has already proven, time and time again, that it is a solid investment, you should go for this model. The trap is a cage made from galvanized steel and equipped with 12-gauge wire mesh on the sides. On one side, there is a door that once the trigger is activated, will drop and catch the animal inside. You can use it for any pests you might need to deal with such as squirrels, weasels, rats, and other small critters. One great thing about this cage is that it allows you to deal with the pest on your property in a humane way. The trap will not kill the animal inside and will keep it there until you come and take it away. By releasing it away from your property, you can ensure that you won’t have to deal with pests anymore and that you can also reuse the trap. One great thing about this trap is that it comes ready to use; there are no moving parts to assemble, and it works as it is. For people who want to deal with pests humanely, this trap is an excellent option because the trap will not kill the animals trapped inside, and you can release them later. You can use this model for any small critter, and not only rats; chipmunks, squirrels, and weasels can also be caught with it. The way the model is designed prevents the critter caught inside from damaging the trigger and thus render the trap unusable. It is essential to mention that the tri-plate used for triggering the door is highly sensitive and won’t let any critters get away. The cage appears to be quite light, which means that it cannot be left for hours unattended, or some animals might find a way to get out. Some traps can be used inside, but there are also outdoor rat traps that can protect your property around your home. If that is something you are looking for, then the Rugged Ranch 100063928 Squirrelinator is just what you need. With a capacity of 25 squirrels, which, according to the manufacturer, you can catch within a few hours, it is one of the largest available. Of course, while it is called the Squirrelinator, it is excellent for dealing with a large population of rats and other small critters that might ruin your garden or try to enter the house. The most important advantage of this trap is that you will not have to spread many baits around, which can lead you to quite the expense. Not many models on the market can trap alive so many animals at the same time, so the Squirrelinator comes highly recommended. This model is a live trap, which means that you will not have to deal with cleaning after dead animals after they are caught. You will be able to save up a bit of money on bait, as you will not have to spread it around, sometimes without proper effects. Users say that they like that this trap comes ready to use and there is no need for extra tools to put it to work. It cannot be ignored that this model is highly-effective and can catch a large number of critters within just several hours. Many people will like this trap because it is great for the environment, as it doesn’t require the use of poison and other harmful chemicals that can affect the environment, as well as the fauna. This trap seems to be quite expensive, and, if you’re not dealing with an infestation, the investment might not be worth it. 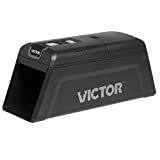 If catch and release traps are not your kind of thing and you would like to go for an electric rat trap instead, take a closer look at the Victor M2 Smart-Kill. This model uses high-voltage shocks to kill rats on the spot, which means that you won’t have to deal with some unpleasant aftermath when using a trap to get rid of pests. An interesting aspect of this model is that it can offer you information on when it catches something via its dedicated app. Seeing how busy people are today, it can be a good thing to have an application that lets you know on your smartphone when the device you’re using did its job. However, that’s not the only strong point of this model. The high-voltage used ensures that the rats die a humane death, so you will not have to worry about a thing while you manage to get rid of the pests in your home fast and efficiently. There is a bait cup with a door to access it, allowing you to set the bait in a convenient manner and without having to open the entire cage. It is a unit that works with high-voltage shocks to ensure that the rats die within seconds after they are caught, without suffering a slow death. Using the app included for this device, you can monitor multiple traps at the same time, and you will also get alerts only when something gets caught. Setting up the trap is a breeze, and that fact that you can monitor it via Wi-Fi is a great thing in itself and contributes to its convenience. This trap will save you a lot of time by letting you know when it’s the right moment to go clean it. After each kill, you will have to clean the trap so that you can use it again, which is a downside with all electronic traps. When someone says ‘rat trap’, you most probably think of the classic wooden snap trap that used to be a fixture back in the days. The Victor rat trap reviewed here has the same design as the original one, and it was this company that created this type of trap to get rid of rodents. So, if you want to deal with pests in the old fashioned way that has been tried and tested over and over again, getting the Victor Metal Pedal is the way to go. Its main advantage is simplicity. The snap trap design will make sure that the critters won’t escape once they are set of getting the bait you place over the trap. It is important to know that this trap is designed to help the environment. Made from wood obtained only from FSC certified sources, it is an excellent option for anyone looking for something simple, yet effective. The simple design has proven effective time and time again, and many people prefer this model to many others. When the trap is activated, it will act swiftly so that rodents don’t have a chance to escape and even leave with the bait as it happens with poor quality models. As it is made from FSC wood, these traps are environmentally-friendly, something that matters to the vast majority of consumers. You won’t have to worry about cleaning the trap, as you can grab it and dump it in the garbage without any need for complicated maintenance. Users may also appreciate that these traps are proudly made in the US, thus abiding by high standards for quality and overall craftsmanship. Some buyers comment on the fact that these traps are difficult to set and it will take a while for you to get the hang of it. There are various types of rat traps on the market so that you can take your pick. In case you haven’t tried any rat glue traps so far, the JT Eaton 185 Slim Glue is an excellent example of how such a model should work to provide the desired outcome, which is a home free or rats. You can use these traps to catch more than just mice, as they can become a hindrance for pesky insects, as well. Because it is odorless, you will not have to worry about the traps giving away nasty fumes in your house. It must also be mentioned that this model doesn’t use any solvents or poison, so it is safe to use inside a home. Once the mice and insects are trapped, you will have to wait for them to die and then remove the traps and drop them in the garbage bin. You don’t have to rely on dangerous poison or disgusting traps if you pick these glue inserts that will do a great job at catching mice and insects. Users receive a pack of 24 traps, which are enough to place strategically all over the place, and prevent the mice from getting inside. One thing that many people appreciate about these traps is that there is no-mess removal so that you don’t have to deal with the sight of crushed animals when you clean up. Because there are no solvents or poison used, these traps are safe to use even in a house with pets, as there is no danger for their health. The glue traps are odorless, and you will not have to deal with any nasty fumes, either. There are some reviews from users saying that smart mice won’t step on these sheets, so they may not serve the purpose that well. Anyone looking for a good rat trap should take a closer look at the JT Eaton 409BULK Jawz. Equipped with a high tension spring, this trap is quite useful and can be used to get rid of mice or other small animals. You will know that the trap is set correctly when the red label indicates it is so. Another thing you might like about this trap is that it can be used with either liquid or solid bait. As it is delivered in packs of 24 items, you will have enough to protect your property the way you should. Because of its compact shape, it is easy to place in cramped areas. The traps are made from plastic and convenient for inside use. You can set the trap by activating it by hand or foot, so, as you can see, if you dislike the idea of touching it, there are possibilities to use it without your hands. The trap is well made and easy to set up by hand or foot, for the maximum convenience of the user. A red label will let you know when the trap is set up correctly, eliminating all the guessing work from the process, and ensuring results. You will like that you can use it with liquid or solid bait, as it is made of plastic, so it will not absorb the liquids or make a mess in general. Buyers will receive packs of 24 items, a number high enough to ensure that the entire floor can be carpeted strategically with the necessary traps to catch mice and other small pests. Due to the compact size, you will experience no issues with placing the traps in small, narrow places where mice may hide. While the traps seem to work just fine most of the time, there are cases reported of mice not being killed instantly, and also other malfunctions. Not everyone wants to get rid of the rats on his or her property, so, for these people, a no kill rat trap is an excellent solution. If that is your case, the Harris Humane Catch & Release may be just you are looking for. It is highly effective, and you will be able to reuse it as you see fit. Another aspect you should know about it is that it is animal-friendly; even if you put it in an area that is trafficked by kids and pets, these will not be exposed to any risk. You will like the fact that this trap is made in such a manner that the trigger can’t be destroyed by an animal trapped inside. Too many other models on the market become unusable because stronger rats manage to destroy the trigger mechanism, but this is not the case with this particular model. If you are looking for a no-kill trap, this model is ideal because it is made with the principle of catch and release in mind. Due to its particular design, it is not easy to damage by a stronger animal trapped inside, which prolongs its lifespan. The trap is safe to use in the proximity of pets and children, which means that you can place it anywhere is needed. By purchasing this trap, you will contribute to the greater good, as the manufacturer donates 10% of its profits to the Etowah Valley Humane Society. As it is transparent, you will be able to see when there are animals trapped inside, so that you can take the trap away and release the caught critters. The trap seems to be quite capable, but some buyers say that it seems to be too small, and any caught mouse will suffer in there if you don’t check it. If reliability is something you want to count on, the Kness Snap-E is the type of trap you need. The durable plastic used for its construction is excellent to catch mice. Once you figure out how to set up a rat trap, you will notice that this model is highly efficient. At first glance, you may believe that it is pretty much the same as a wooden trap. But there is one element of design that makes all the difference. The vertical bar that catches the mice that steps on the trigger will move only half the distance a wooden trap has to travel. That means that the trap is faster than a regular wooden model. Also, the way the trap is designed allows it to trap mice from any side they may come. When you need to release the caught animal, you need to pull back the bar without touching it. The primary attribute of this trap is its sturdy design that is made from durable plastic, giving you good value for the money spent. It comes with a sensitive trigger mechanism, and it acts quickly; the manufacturer advertises this model as being faster than regular wooden traps. A great thing about this model is that you don’t have to touch the trapped animal when you need to clean the trap, due to the design of the release bar. The vertical bar travels only half the distance wooden traps have to, which means that its action is more swiftly. It is the ideal way to get rid of mice and rats if you are looking for an inexpensive solution to pests that wander in or outside the house. Some customers talk about how challenging to set this trap can be, while others say that it doesn’t appear to be sensitive enough as light mice don’t get caught in it. Another glue trap that makes it to our short list, the PIC Baited Rat & Mouse offers certain advantages that no other traps can provide. For starters, it is entirely non-toxic, which means that you don’t need to manipulate dangerous poison and fear for the health of your pets when working with this glue trap. The model comes with a disposable tray, to allow you to clean the traps with ease after they achieved their purpose. Since cleaning is often a sore point for many owners who don’t want to touch any dead animals, this detail makes this kind of trap a better deal for many. It is sold in packs of 12 so that you can get enough traps to get rid even of a larger infestation. Every trap comes ready to use so you will not have to do anything else once you receive it but set it up in the place you know is most trafficked by mice. Made by a company with a long-standing tradition in making rat traps of all kinds, this model is guaranteed to work for small pests. Users appreciate the fact that these traps are non-toxic, so safe for the environment, as well as for pets that might live in the same house. You will like the fact that the traps come with a disposable tray, letting you clean the place after the mice are trapped and killed with great ease. There are no dangerous poisons or other chemical compounds used for this trap, so there is no risk associated with touching it. As the traps come ready to use, the only thing that remains for you to do is to pick a place for them. Since it’s a glue trap, it may not work the same way for all kinds of rats, and the smarter and the bigger ones might still be able to escape or avoid it. Another trap that doesn’t involve killing the animal caught is the Kensizer Small Animal. You don’t have to be some expert on how to trap a rat to use this model, which means that you will be able to set it up quickly and see results. Because it is entirely non-toxic, this kind of trap will do a great job of protecting the environment, and also will not become a problem in a house with pets and children. As the trap is available in two sizes, you can pick the right kind for your needs. The trap is made from aluminum, and it is very durable. The wire mesh is fine enough so that small animals can’t bite it and create an opening to get away. After catching an animal, you can release it into the wild without having to worry about killing the small critters or causing any harm. It is a catch and release type of trap, so it ensures humane use for such a device, an ideal method for those who don’t want to get rid of pests by killing them. The structure of this trap is very durable because it is made from aluminum and a fine wire mesh that cannot be destroyed by a trapped animal. You will like the fact that you can use this trap outside, to protect your crops, and electric wires, among other things. Because it is 100% non-toxic, it is safe to use if you have pets and children, and the health of the trapped animal won’t be affected in any way. The trap is available in two different sizes so that you can pick the right one for your needs. At least one reviewer remarks that the spring appears to be too short, making the trap challenging to set and serve its purpose. Among the many rat traps for sale you can find right now on the market, you will find the JT Eaton Speedy Clean. It is quite a unique trap in the sense that once you catch the mice inside, the method recommended to get rid of them is by submerging the trap in a bucket full of water and drowning the pests. Of course, you can take the trap away from home and release the rats back into the wild if you want to ensure a humane use for this device. There are two versions available, one with a solid lid and one with a clear top, allowing you to take your pick. Since the trap is quite compact, you will find it easy to place it in an area where other traps cannot be easily accommodated. Due to its particular design, it can catch multiple mice at the same time, helping you get rid of bigger infestations. In case you are interested in catching more than one mouse, this trap may be precisely what you need. At the same time, the compact size of the trap will allow you to place it in cramped areas that you can’t usually use for setting up such devices. You can choose the model with a clear lid that lets you observe if any mice were trapped without opening it. Also, in case you don’t want to look at all at the captured critters, you can pick the version that comes with a solid lid. Users can choose to use this trap as a catch and release model if they don’t want to follow the recommended method described by the manufacturer. This trap is not for people who are squeamish about getting rid of the trapped rats by drowning them, according to the instructions provided with the product. Dealing with pests, such as rats, can be a serious issue because these small critters seem to be very resilient and they don’t have a problem with finding ways to get into your house. Before you consider creating a homemade rat trap, learn from our guide all that you need to know to get a model that will work for you. Whether you want the best outdoor rat trap or you want one that works inside, this information will help you narrow down your search. If you take one look at all the models on the market, you will notice that there are several design options we can talk about. The snap trap models are the oldest to have ever been around. For more than a century, such traps have dealt swiftly with pests and infestations, in eras when exterminators were not that easy to find and employ. Of course, each type of rat trap we are going to talk about has its ups and downs. In this case, if you don’t get a sturdy model, the metal pedal that will catch the mouse may not be strong enough to deliver a clean kill. That means that the rat caught in this manner might suffer a lot before dying. 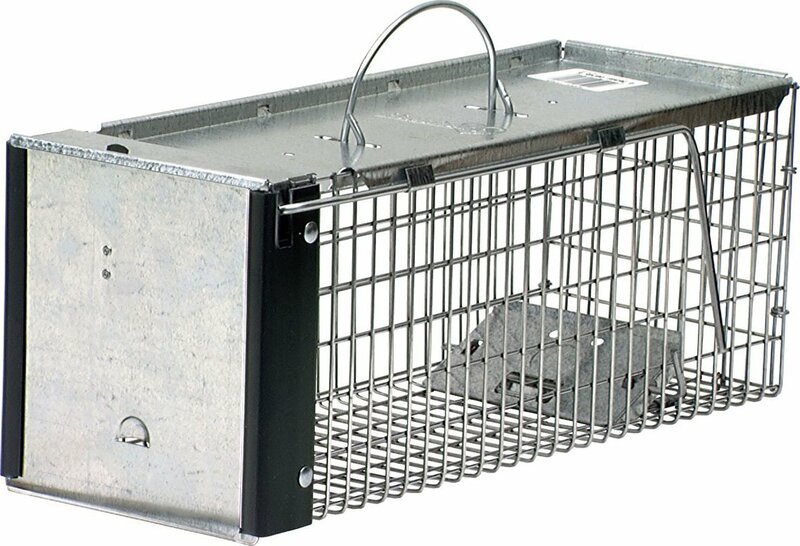 Another common type available right now is the rat trap cage. The principle behind this design is simple. The bait is placed inside the cage, the animal walks inside, drawn by the bait, and then it actions a door that drops and captures it. There are big rat traps in this category, and you will find some models that can catch multiple rats at the same time. You will find other designs if you’re looking a little closer. For instance, some electric models deliver electric shocks to kill mice and rats. Unlike other traps that might let the trapped animals die a long and gruesome death, this one is more efficient. But, as you can expect, such models are not among the cheap rat traps you can find. If you want to spend less, you need a glue rat trap. However, if a rat is strong enough, it can free itself. Also, the rats caught like this will die a painful, slow death, due to dehydration. How humane is the rat trap you intend to use? You have noticed above how, when we talked about the various types of rat traps, we delivered some information on how the particular designs work. That brings us to the question of how humane a rat trap can be and if that is an essential aspect for you. The most humane traps are those that are designed for catch and release. Those would be the cage type traps for a simple reason: there is no mechanism that can kill or harm the trapped animals in any way. After they are caught, you only need to grab the cage, take it somewhere away from your property, and release the critters. Others refer to humane killing when they’re talking about this aspect. The electric type is superior to other designs as it works with high-voltage to ensure that even the largest rats will die after being administered the electric shocks for a couple of minutes. Of course, it all depends on how well such traps are built. You must remember that they are not large rat traps and that means that you can only catch one animal at a time. The worst type, regarding how humane, or better said inhumane they are, must be the snap trap design and the glue models. When a mouse is caught by a snap trap, anything can go wrong. The metal pedal might crush its back and keep it there, between life and death for hours. Also, glue traps can be inhumane in other ways. They work by trapping the rats with their feet glued to their surface. The rats suffer a painful and long death, as they die of dehydration. If you place such traps in your house, you will be able to hear the rats dying, which can cause a lot of distress. They might be a good option for barns or other enclosed areas. Many people talk about what the best food for rat trap is or how efficient the models they use are. But there is one aspect that you surely want to learn about, and that would be the cleaning process. Traps that are designed for one-time use only can be easy to get rid of. You have to grab the trap with the dead animal inside and drop it into a garbage bag. But there are types of traps that are not so manageable when it comes to cleaning. While highly effective, an electric model is the worst in this respect. After each kill, you will have to clean, and that can prove quite a challenge and certainly not something for people who are squeamish as a general rule.